. 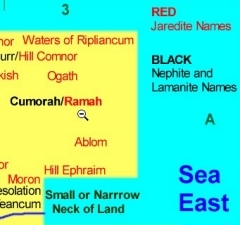 This page provides a generic map or schematic diagram of the Book of Mormon lands, including Nephite, Lamanite and Jaredite place names in the promised land in the Americas, without providing any scale, or attempting to relate them to present-day geography or place names. The map is adapted from a map by Joel Hardy from March of 1998, with revisions to 2005 (see original). Joel's geography web page also provides some comparisons and other maps that relate in some ways to present day geography. His MormonHaven.com website contains a tonne of current, reliable information concerning the Church of Jesus Christ of Latter-day Saints. By using a generic map on which to locate place names, we focus here on geographic information provided in the scriptures. The intent is to show some sense of conceivable and plausible locations and relationships between places and the key features: the narrow neck of land (delineating the land northward and land southward), the narrow strip of wilderness (which ran from the east even to the sea west), and the oceans/seashores. 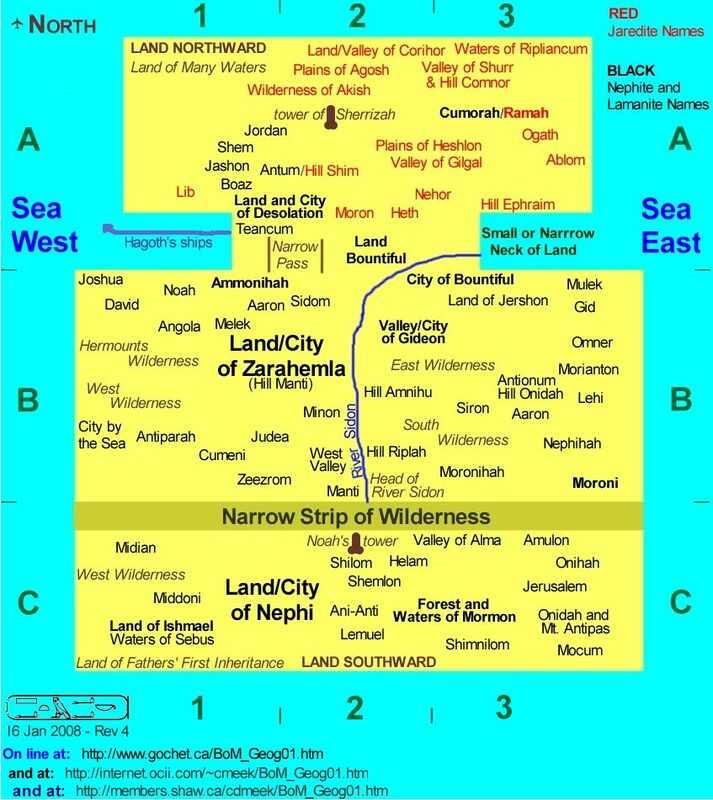 This generic approach allows us to avoid being bogged down with relating either places or features to any present-day geography (significant changes to which occurred at the Savior's advent among the Nephites as described in 3 Nephi 8:11-12, 4 Nephi 1:9, and elsewhere). We also wanted to provide a map in a form that could be printed in sizes that will fit in typical bound scriptures. A Book of Mormon Timeline (~200 Kb) with Dates and Locations for Events. Below is the generic map that will likely fit on your screen. Click on the image to open a new window and display a full-sized map. See below for further information and suggestions in its use. Here are some notes and suggestions about viewing and printing this map. If you click on the above image, your browser opens a new window and displays the map by itself, with no words, etc. If your full-sized image looks like the map fragment to the left, and your mouse pointer looks like the (+) symbol in a circle, then click that to give you a full-sized version that will look more like the fragment to the right. If you are using Microsoft Internet Explorer browser, and when you run your mouse over the lower right of the map image, you see the enlargement icon (a screen with four blue arrows pointing outwards on the diagonals), then click that for a full-sized version. The 650 x 688 pixel version prints on an 8 1/2 by 11 inch page in my system. In either case, you may have to scroll up and down (and maybe left-to-right) to see the whole map on your screen. But the lettering will be much more readable. If you print the more readable one, it will likely fit on an 8 1/2 by 11 inch page. Here are a selection of sizes that may be helpful, or more suitable for printing. At each size, the .JPG requires much more file space, and will take much longer to download. To my eye, the .JPG quality is not any better. I therefore recommend the .GIF format in every size. If you decide to re-size to your own dimensions, pick the largest size, and re-size that. Re-sizing downwards always produces a better result than re-sizing upwards. All these files will open a new window in your web browser. To return here, just close the new window. As an 850 x 950 pixel .GIF (104 Kb file size) [this is the one shown above]. As an 850 x 950 pixel .JPG (162 Kb file size). As a 650 x 730 pixel .GIF (72 Kb file size) [Recommended for Internet Explorer users]. As a 650 x 730 pixel .JPG (102 Kb file size). As a 500 x 560 pixel .GIF (47 Kb file size) [Recommended small-sized version]. As a 500 x 560 pixel .JPG (64 Kb file size). As a 350 x 395 pixel .GIF (25 Kb file size) [Recommended mini-sized version - may fit smallest scriptures]. As a 350 x 395 pixel .JPG (33 Kb file size). As an 850 x 950 pixel .CPT file (362 Kb file size). Finally, if nothing here works quite right, send me a note, and we will see if we can eventually make something more useful for your equipment, software, and printer. Don't be bashful; perhaps something else will be helpful for others, too. 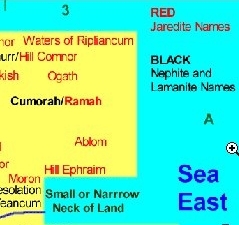 List of Place Names with Scriptural References, and a Book of Mormon Timeline. The list of place names and their scriptural references (~800 Kb) may be seen separately. . A Book of Mormon Timeline (~200 Kb) with Dates and Locations for Events is also available. .
. For other websites on Book of Mormon Geography just Google the topic. Presently there are well over 2,000,000 possibilities returned. .
. ..... Return to TOP of this page. ........ ....... Return to the Meek Family HOME PAGE. Title: Generic Map or Schematic Diagram of Book of Mormon Geography. Page maintained by: Chet Meek, cmeek@ocii.com ... direct e-mail. Page originally posted: 23 December 2005 - the 200th anniversary of the birth of the prophet. Page last updated: 7 Oct 2018 (Sm 2.33.n ff, w/SC; Win10pOn ). Page created: 15 December 2005.